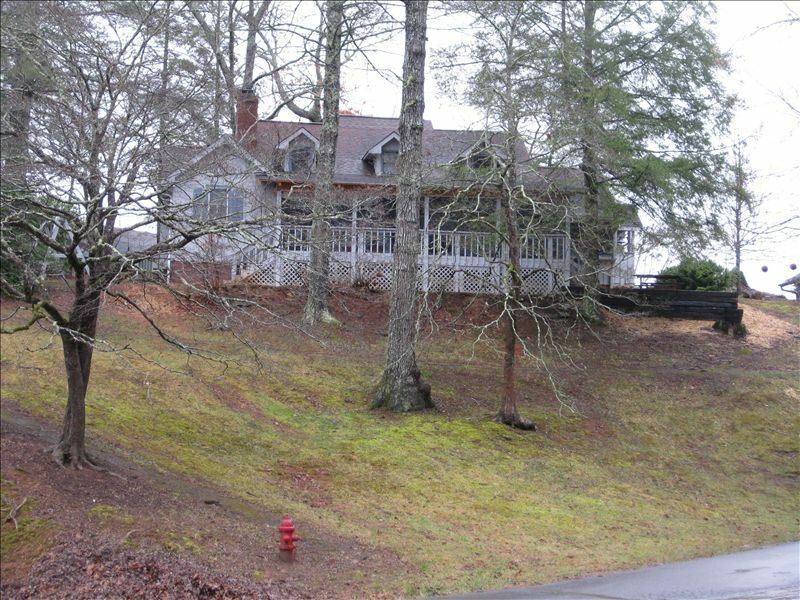 This was the dam superintendent's home where such guests as President Roosevelt stayed when he visited the Hiwassee Dam. Years later Navy Seals stayed in the house when they were training in the area. We bought and Hilltop because of its outstanding view of the lake and the mountains. We added a bedroom and 2 new bathrooms to make it our fit our family. Now it has 4 bedrooms and 3 bathrooms! It is located on a mountain top in the gated community of Bear Paw on Lake Hiwassee. It is in walking distance of the tennis courts, pool, basketball court, children's playground and fishing pond. The nearby marina has boats available for rent. The delightful cabin has all you need for a peaceful vacation. The kitchen with its granite countertops is ready for cooking. You will find everything you need for preparing and serving meals except the food. There are four bedrooms with 2 doubles, 2 queens and two twin beds. The cabin has wireless internet, so it makes it easy to check your email. The large screen porch provides an ideal spot to drink your morning coffee or watch the sunset over the lake. On the porch you will find a wonderful farm table for great meals and enjoyment. This is a family friendly house with books to read and games to play. We welcome you to sample our “little bit of heaven”. My husband decided to purchase this property while I was at the grocery store because of the remarkable view of the lake and the mountains! The scenery was beautiful and the house was almost perfect. The house would have been perfect if we could have used the fireplace. We were shocked on how well equipped the kitchen was. We will definitely go back. Thank you so much for leaving the cabin in such wonderful condition! The housekeepers appreciated so much! Please come again! The property was nice and quiet and had everything we needed. We enjoyed our stay very much. The property was very quiet even though there were many houses up there. The house was clean and had everything we needed. Thank you very much. So glad you enjoyed your stay at Bear Paw. We hope you will come again. The cabin had everything we needed. We spent a lot of our time on the porch that over looks the lake. Beautiful view! This is the place to stay if you have a large group. We were so glad to share our cabin with such a lovely family. Hope you will come again! What an amazing weekend we had full of fun and memories. We will be coming back for sure. Loved waking up to the view of the lake. Thank you so much! Hope you will come back soon. We were all so impressed with the cabin. It is perfect for a family vacation! Rented the second week of July 2018. From the moment we entered we were blown away by how comfortable and charming we found the cabin. Pictures truly do not do it justice. The four bedrooms and three baths were a luxury with 8 adults and 3 children. Everyone had space and privacy if needed. The beds are all excellent. The whole cabin is stocked with everything you could need and more. The kitchen is perfect. The porch is the real highlight. Children played games on the table and the adults reveled in the evening views of the lake, the mountains, and the sunsets. So convenient also to the marina where we rented a pontoon for three days. The lake is pristine and it seemed at times if we were the only people on the water. One of the best vacations ever. We will be back! The Banks are so responsive and truly understand Southern hospitality. Our Georgia graduate kids didn’t even seem to mind that they are Alabama fans!!!! If you’re from Georgia you get that is truly high praise! Thank you for staying at our cabin! It is always a delight to have such wonderful people there. Please come again! My family of 8 loved our stay at Hilltop. The cabin was so clean and well stocked, the beds were very comfortable, and the community was friendly! We loved having three bathrooms as well. The large screened porch was wonderful, we were out there all the time. The internet and phone service was spotty but it wasn't a huge problem. My son didn't pull out his laptop all week! Thanks Ellen! Thank you so much for staying at our cabin. We were so glad you were able to spend the holidays at Bear Paw! It is our pleasure to have your family!